Chambered mufflers use internal chambers to produce a specific exhaust note. These chambers come in different lengths and sizes to create the tone, and mufflers can include just one chamber or multiple chambers. Chambered mufflers provide decent noise reduction for the street while creating that classic musclecar growl. Flowmaster 40 Series Mufflers uses a two-chamber design to deliver a deep, rich tone without creating too much backpressure. In general, fewer chambers mean less backpressure and noise reduction. 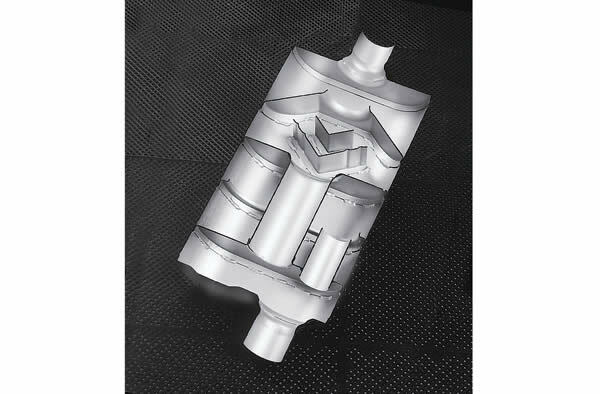 More chambers will typically result in quieter performance but more backpressure. Flowmaster offers a spin of chambered mufflers with its Delta Flow technology. This design places Delta-shaped baffles within the chambers to produce a deep, distinctive exhaust note that will turn heads. Flowmaster also says the optimized exhaust flow created by the shape of the baffles will enhance power. 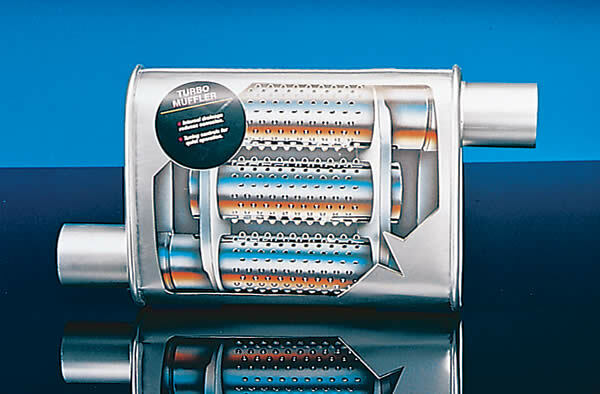 Thrush Turbo Mufflers use a set of internal perforated tubes to route exhaust gasses through the muffler. 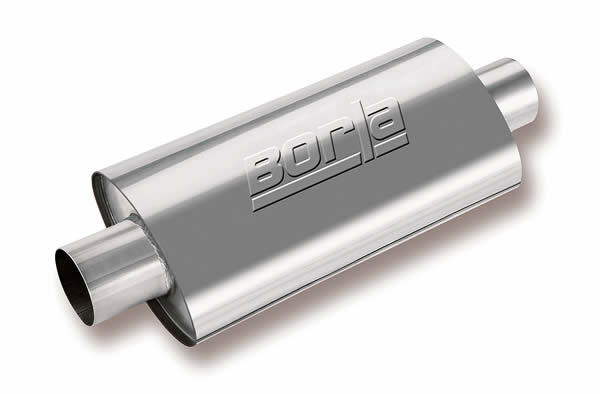 Borla's XR-1 Racing Muffler is a great example of a straight-through muffler. Exhaust gasses are routed through a straight, perforated tube, which is wrapped in stainless steel insulation to absorb some of the sound. This design creates minimal backpressure and just enough sound reduction to meet track regulations. 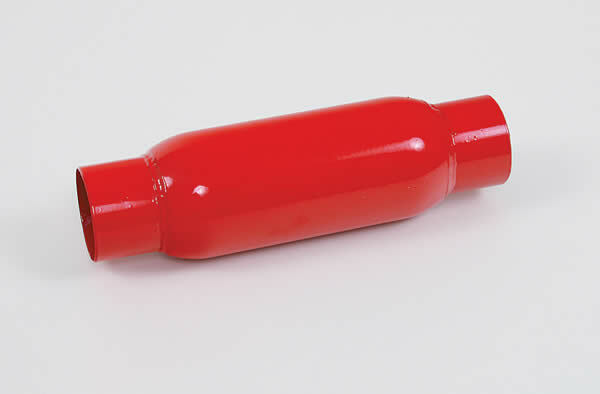 The Cherry Bomb Glasspack Muffler offers a straight-through, reversible configuration--a classic design that's been around for decades. 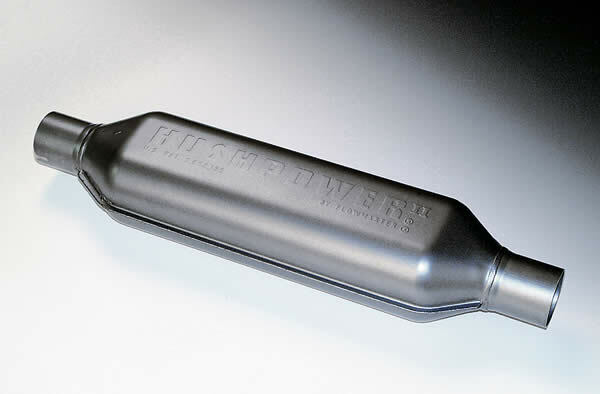 Straight-through mufflers, like this Hushpower II Muffler, are popular with street rodders and custom car builders because of their compact design. Make sure to check local sound laws before picking a straight-through muffler for your hot rod. What does high performance sound like? Depending on the muffler, the sound of high performance can be anything from a low, throaty growl to an ear-splitting roar—and everything in between. The ideal muffler will deliver just the right growl, roar, or rumble to back up your vehicle’s performance and appearance. That’s why it’s important for hot rodders to choose the right muffler for their vehicle. The job description of a muffler is simple: noise reduction. Once internal combustion takes place, the engine expels exhaust gasses in the form of high pressure pulses. These high pressure pulses create very powerful sound waves, and the muffler is tasked with reducing this powerful sound to a tolerable level. Is it a single or dual system? This will help you determine the number of inlets you need on your muffler. For example, a single exhaust will require a single inlet on the muffler. If you’re merging a dual exhaust into one muffler, you’ll need a dual-inlet muffler. What is the exhaust pipe diameter? You’ll need to match your inlets, and in some cases outlets, to match your existing exhaust diameter. How much room is available for the muffler(s)? You’ll need to make sure the outside dimensions of your muffler allow for proper clearance under the vehicle. The right length will ensure easy installation and proper clamping; the right casing size and shape will allow it to fit within the confines of your vehicle’s undercarriage. The three main muffler styles are chambered, turbo, and straight-through. Each style has its own set of benefits and drawbacks. Ideal for street machines and muscle cars, chambered mufflers are designed to reduce exhaust noise while providing a throaty performance sound for the street. They use a series of inner chambers that are configured at specific lengths to reflect sound waves against each other. As the sound waves bounce into one another, they cancel each other out, causing a reduction in exhaust noise. The exact exhaust tone and noise reduction of chambered mufflers depends on the size and number of the chambers. Some manufacturers also use sound-deadening baffles or inserts within the chambers to further reduce or alter exhaust sound. Turbo mufflers typically use a set of perforated tubes, which often guide the exhaust gasses through the muffler in an S-shaped pattern. Although this design is more restrictive than other styles, the S-design allows the gasses to travel through more tubing for better noise reduction. Ideal for street applications, some turbo-style mufflers also incorporate a sound deadening material, which is packed around the tubes for increased muffling. Straight-through mufflers, or glasspacks, are designed to allow maximum flow—and horsepower. 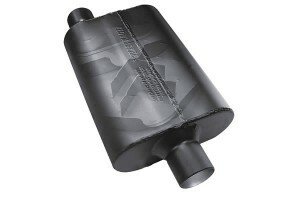 These mufflers feature a straight, perforated pipe wrapped in sound absorbing material such as fiberglass packing. Ideal for racing, this setup allows exhaust gas to flow through the pipe with very little restriction but provides less sound reduction than chambered mufflers. The straight-through design also tends to be more compact than other muffler styles, making it a popular choice among street rodders and custom car builders. Mufflers must be built tough to handle high pressure exhaust gasses, absorb impact from road debris, and resist corrosion. Manufacturers typically use a three-layer body consisting of an outer shell, an inner case, and a slightly insulated layer in between. The muffler body is usually made of aluminized or stainless steel. 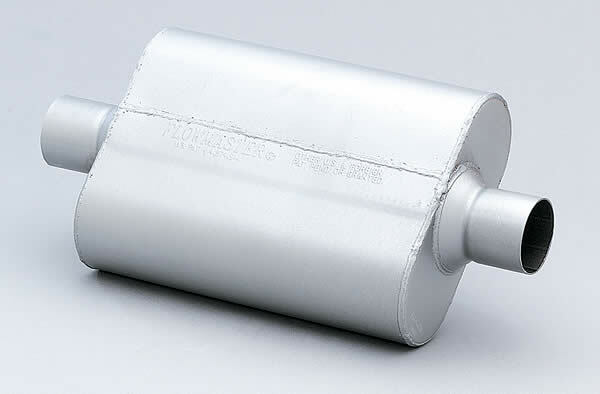 The advantage of choosing an aluminized steel muffler is cost. Aluminized steel is generally less expensive than stainless steel; however, stainless steel mufflers offer superior corrosion resistance, durability, and life span than the aluminized steel versions. Click on the slide show link above for examples of different muffler styles and configurations. And be sure to check out our posts on headers and exhaust styles to round out your exhaust system knowledge. I own a 2016 Chevy Z-71 pick-up and would like to get a little more rumble out of exhaust. Rather than doing a cat back system I was thinking of replacing the original muffler with a short straight-through Cherry Bomb and leaving the rear resonator to quiet things down a little. Do you think this system would sound OK or is the resonator too restrictive???? Thanks for reading! Resonators are not restrictive, they are sound absorption devices as you’d like to use it. The Cherry Bomb though, will make it louder, resonator or not! I’m an amateur when it comes to car knowledge, but I recently got a 2013 Mustang V6. I want a deeper and louder “growl” from my exhaust but I’m not sure what to purchase in order to achieve that. Any suggestions on what my best option may be? Hi Lilly! You can alter the sound of your Mustang with a muffler or a cat-back exhaust. A quick look at Summit Racing’s site tells you about the different sound levels of the mufflers available: https://www.summitracing.com/search/part-type/mufflers/engine-type/v6. 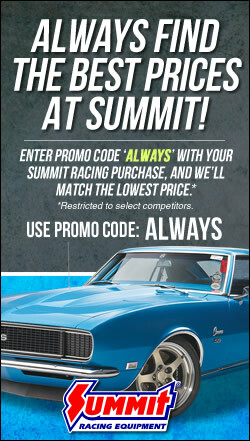 You can also go to Summit’s YouTube page for some exhaust system sound comparisons on vehicles similar to yours: https://www.youtube.com/user/SummitRacingVideos/search?query=mustang+mufflers. Your best bet would be to call Summit at 1-800-230-3030 and they’ll be able to help you narrow down your options. Thanks for reading! I have a 1967 Buick GS400 that I am putting a built 462 BBB into it will have 550+ HP and little bit of a lobe to the cam. I will be running a 3 inch x-piped exhaust off the full length tuned headers it will go over the axle and out under the bumper. I know It is going to have loud tone to it but what is the quietest mufflers I can put on this system? I have 2017 1.8 jetta sport looking for a low sounding muffler? If you want to improve your experience simply keep visiting this web site and be updated with the latest news update posted here. I like what you said about the right muffler and how it will produce just the right roar or rumble. It’s important to have a working muffler at all times in order to not disturb the public. If I were to buy a new muffler, I would make sure to contact a supplier that can give me quick and efficient service.